Our powder extinguishing systems for room and object protection. The extinguishing powders used in powder extinguishing systems are highly efficient, quick-acting extinguishants. The sudden extinguishing effect of the powder cloud is caused by the suffocation effect and the anticatalytic effect, a chemical intervention into the combustion process. Extinguishing powders mainly consist of non-poisonous inorganic salts mixed with waterproofing and pouring agents. 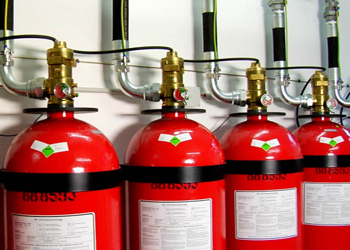 They are used for fires with solid, liquid or gaseous substances and for metal fires, thus, they are used for fire classification A, B, C and D.
If several rooms and objects are to be protected with powder extinguishing systems, a central powder storage in compression-proof steel vessels, which is sufficient for all protection areas, should be provided. Small powder extinguishing systems are recommended for objects with a limited scope of protection. To a great extent the design and dimensioning of such powder extinguishing systems is standardized for several similar objects and thus, costs are minimized. They are preferably used in extractor hoods, exhaust air ducts, laboratories and experimenting institutes etc. Ships carrying liquefied gas and certain chemicals/agents in bulk shall be equipped with a fixed dry powder system ready for operation. Gielle is one of the main suppliers of fixed dry powder systems, which comply with the IGC and IBC codes from SOLAS. 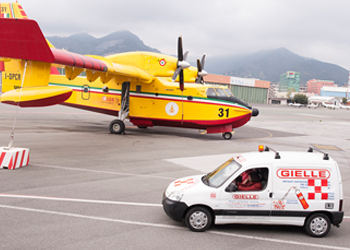 Gielle systems are recognised by all leading classification societies and international authorities. Characteristics . Dry chemical powder, when introduced directly to a fire, causes the flame to go out almost at once. The chemical used is in principle Sodium or Potassium Bicarbonate (BC). Various additives are mixed with the base chemicals to improve the storage, flow, and water-repellent characteristics. Dry powders are stable at both low and high temperatures (up to 50 deg. C.) BC powders are non-toxic, but due to the size of the particles (10 to 50 microns) temporary breathing difficulties may occur, and personnel must stay clear of the jets to avoid suffocation. App lication. Gielle dry powder systems have been developed to meet the increasing demands for large capacity systems for use in the extinguishing of fires involving bulk chemical agents and liquefied gases. SOLAS rules (IGC and IBC) require that dry powder systems protect the entire deck area, cargo manifold, and connection areas from fixed monitors. In addition the system should be capable of supplying dry powder to any part of the cargo deck from at least two sources i.e., hand hose or hand hose line/monitor. In order to design and calculate a system it is necessary to know the length, breadth, and format of the cargo deck together with details of any obstacles such as tank omes, cargo storage, and handling facilities, etc. In general, all dry chemical powder systems should be thoroughly inspected and checked annually. The inspection and maintenance of hand hose line systems will vary with the location and climate conditions. Dry chemical powder is available in various sized packages. Whatever the container, it should be kept tightly closed and stored in a dry location in order to prevent absorption of moisture. Once the powder has lost its free fl owing characteristic, it shall be discharged. Our ongoing internal training programs make our employees - naval architects, sales engineers, project managers, service engineers etc. 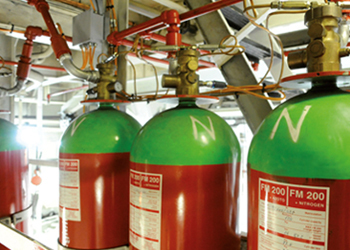 – fully qualifi ed to handle our fire fighting systems for the marine industry. An important element is the use of an approved computer program for hydraulic calculations, which secures a quick and precise system design.